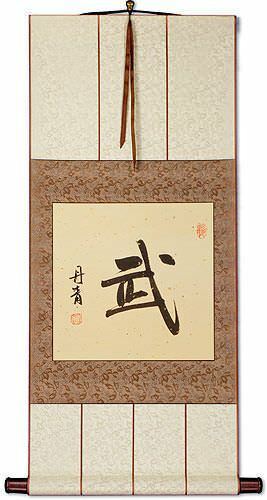 Buy a Spirit calligraphy wall scroll here! 30. The Spirit of the Dragon Horse and Power of a Tiger. 精神 is the kind of spirit that you have if you perform well in sports or competition. It is the idea of having a good attitude, and putting your all into something - so much so that others can see or feel your spirit. It is the essence of your being that can only be subjectively described because there are no words that can fully explain what "spirit" really is. My Japanese dictionary further tries to explain this word by comparing it to mind, soul, heart or intention. My Chinese dictionary compares these characters to meanings like vigor, vitality, drive and mentality. My Korean dictionary defines this as mind, spirit and soul. This is probably the best way to express the idea of "Body, Mind and Spirit" in Chinese and old Korean Hanja. We are actually using the word for "heart" here because for thousands of years, the heart was thought to be the place where your thoughts, feelings and emotions came from. We do something similar in the west when we say "warm-hearted" or "I love you with all of my heart." In this context, heart = mind in Asian language and culture. The very literal translation of these three characters is "body, heart & spirit" which could also be interpreted as "body mind & soul." We have arranged these characters in this order because it simply "feels" like the proper order in the Chinese language. Word lists like this are not so common for calligraphy artwork, so we have to be careful to put them in the most natural order. It should be noted that this is not a common title in Asia, nor is it considered an actual phrase (as it lacks a clear subject, verb, and object). In Japanese Kanji, they use an alternate form of the character for soul or spirit. If you want this using the Japanese alternate, please click on the Kanji shown to the right instead of the button above. Japanese disclaimer: This is not a natural phrase/list in Japanese. While not totally-natural in Chinese, this word list is best if your audience is Chinese. This Japanese proverb means "indomitable spirit" or "unyielding spirit." This literally means "fighting spirit" or "the will to fight." As in the spirit that a warrior, soldier, athlete or fighter must possess. 御影 is a Japanese word that means divine spirit, or honorific language for "spirit of the dead." In Buddhist context, it can mean (wooden) images of saints or deities. 御影 is also a Japanese name, Mikage. Note: This is also a word in Chinese but not used very often in China (except perhaps by certain Buddhists). 獨立精神 means independent spirit in Chinese. The first two characters mean independent, independence, or to stand alone. The last two characters can mean spirit, spiritual, vigor, vitality, drive, mind, consciousness, thought, essence, heart or soul. With this information, you can make your own translation combination such as "independent heart," "stand alone spirit," or more creatively, "the drive to stand alone" in English. There are a lot of ways to interpret 獨立精神. This literally means fighting spirit. As in the spirit that a warrior, soldier, athlete or fighter must possess. Note: There is more than one way to write the first character of this word. It is sometimes written like the version shown to the right (yes, it's completely different but has the same meaning & pronunciation). If you have a preference, please let us know in the special instructions about your order. 美しい精神 is a common way to write "Beautiful Spirit" in Japanese. 闘魂 is an alternate title with the meaning "fighting spirit" or "the will to fight." 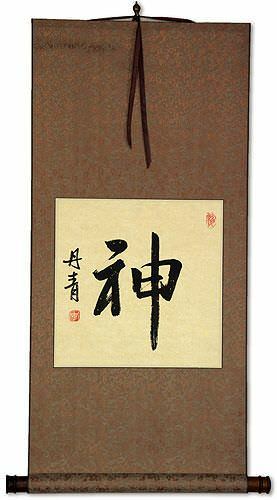 This Chinese title means "unyielding character," "courageous spirit," "integrity," or "moral backbone." 龍虎精神 means the spirit of the dragon and tiger. It speaks to the vitality and vigor that is the nature of these two creatures. Beyond "spirit," the second two characters can also mean mind, soul, or heart. Therefore, you can also say this means "Heart of the Dragon and Tiger," etc. 龍虎精神 is often titled as "Ryukoseishin" in many Japanese martial arts. 英氣 is a way to write heroic spirit in Chinese. This may be an arrogant thing to hang on your wall. This Chinese, Japanese Kanji, and old Korean Hanja title can mean, "dragon god," "dragon king," or "dragon spirit." In the context of Buddhism, this is one of eight kinds of spiritual beings found in Mahāyāna texts. 闘気 is an alternate Japanese title for "fighting spirit." This one is more like "fighting energy." 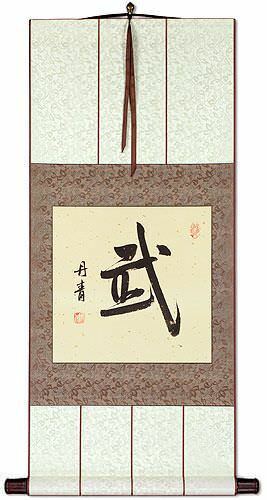 The second character is "ki" the same "ki" in Aikido. This "ki" is the spiritual energy that all martial arts practitioners must master and focus. 靈 is spirit or soul in Chinese, Japanese Kanji, and old Korean Hanja. quick; alert; efficacious; effective; departed soul; coffin; spiritual; energy; effective; clever. There is a modern Japanese version of this character. The button above will get you the traditional/ancient form. But, if you want the modern Japanese, click on the Kanji to the right instead. 心 would often be translated as "heart". However, because it was believed in Chinese culture thousands of years that your consciousness and thoughts came from the big red organ in the middle of your chest, it also means "mind" or "spirit" and sometimes even "soul." In Korean, beyond heart, mind, and spirit, this character can mean moral, nature, mind, affections, intentions, core, and center. In fact, it is used in Chinese to mean "center" as well but only with another character in front of it. For instance, "medical center" or even "shopping center." Separately and alone, it will not be read with that "center" meaning unless thought of as "the center of your soul." This Korean proverb means "indomitable spirit," at least, that is the way it is commonly translated in martial arts circles (Taekwondo, Hapkido, etc.). The literal translation is "[one] hundred [times] broken [still] don't succumb." Or more naturally translated, "Even if attacked/beaten one hundred times, still be undaunted/indomitable." Some will say this is one long word rather than a proverb. 百折不屈 is also a proverb/word in Chinese though rarely used in modern times. In Chinese, this means Goddess of Beauty. The first character means beauty or beautiful. The second character means spirit (can also mean god, goddess, or soul). Some will use this as a short way to say, "Beautiful Spirit." This has a similar meaning in Japanese but is used more often as a female given name in Japan. As a Japanese given name, it can be pronounced Mikami, Mikan, or Binasu. 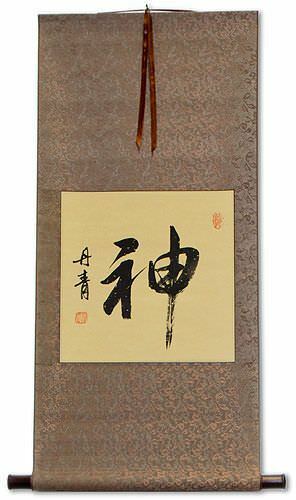 雄心 is the Chinese characters and Japanese Kanji for great ambition, lofty aspiration, or heroic spirit. 魂魄 is a Chinese, Japanese Kanji, and old Korean Hanja term for ghost, soul, or spirit. Animus and anima; the spiritual nature or mind, and the animal soul; the two are defined as mind and body or mental and physical, the invisible soul inhabiting the visible body, the former being celestial, the latter terrestrial. This Chinese word can mean, "esprit de corps" or "team spirit." Other translations include, collectivism, teamwork, or solidarity. 聖靈 / 聖霊 is the title for the Holy Spirit or Holy Ghost as used by Jewish, Catholic and Protestant (and other Christian) Chinese people. And yes, Chinese Jews do exist, but there are not many of them. The first character means Holy, Sacred, Saint or Sage. The second means ghost, spirit, efficacious or intelligence. In modern Japan, they now use a variant/simplified Kanji of the second character of Holy Spirit. If you want this Japanese version, click on the Kanji to the right instead of the button above. This title speaks of one's soul or spirit, and the capacity or strength that soul possesses. The first two characters mean mind, heart, spirit, and/or soul. The last two characters mean strength, capacity, or ability. Note: Separately, these are two words in Japanese, and can be pronounced but this does not make a natural title in Japanese (best if your audience is Chinese). 獨立心 means independent spirit or independent heart in Japanese. The first two characters mean independent or independence. The third character means spirit, heart or mind. 獨立心 is a Japanese term, although Chinese people would be able to guess the meaning (the characters make sense individually in Chinese but are not often used this way). Also, the first character would be written 獨 in Traditional Chinese versus 独 which is the Simplified Chinese and modern Japanese version. 美麗的心靈 means beautiful heart, beautiful mind, or beautiful spirit in Chinese. 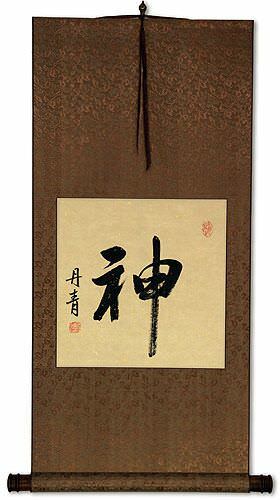 不屈の精神 is one of several versions or ways to write "Indomitable Spirit" in Japanese. This one is the famous, "Fukutsu no Seishin" phrase. Some people may refer to this entry as Spirit Kanji, Spirit Characters, Spirit in Mandarin Chinese, Spirit Characters, Spirit in Chinese Writing, Spirit in Japanese Writing, Spirit in Asian Writing, Spirit Ideograms, Chinese Spirit symbols, Spirit Hieroglyphics, Spirit Glyphs, Spirit in Chinese Letters, Spirit Hanzi, Spirit in Japanese Kanji, Spirit Pictograms, Spirit in the Chinese Written-Language, or Spirit in the Japanese Written-Language. 940 people have searched for Spirit in Chinese or Japanese in the past year.